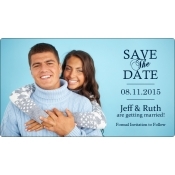 Classic wedding save the date magnets are perfect for announcing your wedding in style. They never go out of vogue because “classic” is always a tone for any wedding. Couples know that they can rely on classic styled invitations to announce their impending nuptials. People will be compelled to retain these customized magnets over their refrigerator doors or other visible surfaces because classic tone is a real eye popper. Save on shipping because it is offered free anywhere within the contiguous USA. A few years back, there was a strong misconception that classic is the word for church weddings complete with flashing diamonds and flowing gowns. Today, people understand that that the term may have a larger influence than expected. They can indulge this term with any kind of wedding organized with a creative flair. 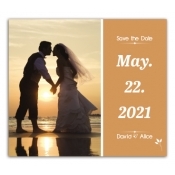 This means you can avail classic wedding save the date magnets to announce any theme or regular wedding. In short, this style suits beach weddings, garden weddings, destination weddings, African safari weddings and more. Sky is the limit for your imagination when it comes to these save the date magnets. Our team can go to any extent to create the design which looks classy and elegant against all odds. Our customized magnets also quash the popular myth that classy things are expensive because we offer great savings on bulk orders and many other freebies, too. Most couples working with small budget find these save the date magnets affordable. They know it will meet their expectations about the quality and help them to put the right foot forward. Although magnetic save the dates are considered as pre-invitations, they play a very important role in setting the mood for festivities. People can easily look at it and understand what is in store for them. Avail free online design proof, free art set up, free full color printing and lowest price match guarantee with all our products. All our personalized save the date wedding magnets in classic style and other themes are made in USA. This means they strongly approve American work conditions and labor. Being lead-free, you can easily employ them for bulk mailing. Send out classic styled save the date invitations at least a couple of months in advance to ensure total participation. 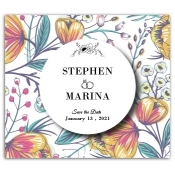 Be it a small church wedding, a tropical destination wedding, lavish mountain wedding or beach wedding, you can trigger that classy feel by seeking any of these custom magnets from our selection. To know more about savings, art set up and more feel free to contact us at 855-762-4638 (Toll Free) or write to us at info@CMagnets.com.